We aren’t quite at our home automation portion of the Helix roll out yet, but we’re getting there. Resolution is constantly adding new products to their home device lines. The engineers over there must be cyborgs or something. Would explain a few things…. It’s time now to talk about access control, though. This is a big topic, so we’re gonna have to do it in pieces. See, access control is not exclusively about key fobs, cards, readers and audit trail. 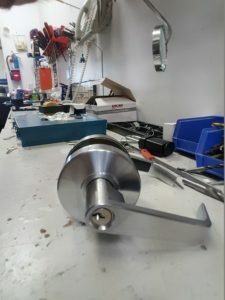 We’ve kind of been conditioned to think of controlled access as this exclusive, super expensive method of securing a business from unauthorised access. Think of access control as an added value for the property you own. It’s not meant for just business, or high tech government facilities. Access Control is meant to provide that level of… well… controlled access to any door you feel you should be controlling access to. Access Control is not always bio-metrics, swipe cards, key fobs or voice activation. Sometimes it’s as simple as a lock with a keypad on it. Seems like as good a place to start as any. 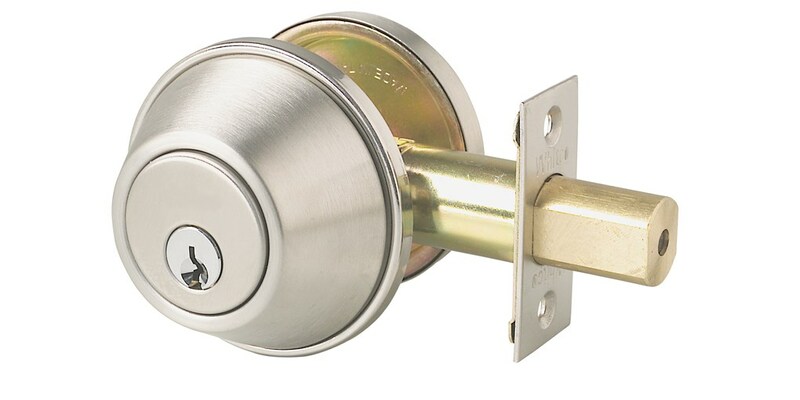 These are the two most basic and common locks found on residential doors. Generally they are designed for 2 3/4 or 2 3/8 back sets, come in a variety of colours shapes and sizes, and are something you use to keep your doors closed when you don’t want anyone coming in. You use a key to lock it, a key to unlock it, and you make sure everyone who needs a key has one. It’s the last line that can cause… concern. It’s very easy to forget who you have given a key to, it’s easier for people to lose the keys you’ve given them meaning you now need to get more cut, and it’s even easier still to no longer want someone to have a key which they will not return. This is where controlled access comes into play. It’s an electronic deadbolt. And it’s controlled not just by a key, but optionally by a keypad. 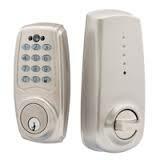 I could spend about 3000 words on the topic of electronic locks for homes. There is an endless list of useful applications, and the cost is affordable enough that you don’t have to worry about breaking your bank to make it worthwhile. Give us a call, visit us on Facebook, or send us an email at service@hbsecurity.com . If you are in the market, know what you want, or just want to know more… we can help. It makes sense that access control would be useful. I just had no idea that even homes could benefit from it! I’ll have to look into the different kinds of access control systems. Hiya, I am really glad I have found this information. Nowadays bloggers publish just about gossips and web and this is actually annoying. A good site with exciting content, that’s what I need. Thanks for keeping this web-site, I’ll be visiting it. Do you do newsletters? Cant find it. I am now not positive the place you’re getting your information, however good topic. I must spend a while finding out much more or figuring out more. Thanks for great info I used to be searching for this info for my mission. I was just looking for this info for a while. After six hours of continuous Googleing, at last I got it in your website. I wonder what’s the lack of Google strategy that do not rank this type of informative sites in top of the list. Normally the top sites are full of garbage. Thanks , I’ve just been searching for information approximately this topic for ages and yours is the greatest I have came upon so far. However, what about the bottom line? Are you certain about the supply? You actually make it appear so easy together with your presentation but I find this topic to be really something which I think I might never understand. It sort of feels too complex and extremely extensive for me. I’m having a look forward on your next put up, I will try to get the dangle of it! Thank you a bunch for sharing this with all folks you actually recognise what you’re talking about! Bookmarked. Please also discuss with my site =). We may have a hyperlink alternate arrangement among us! I in addition to my friends ended up looking at the best secrets found on your web page and quickly got a horrible suspicion I had not expressed respect to the blog owner for those techniques. My ladies became totally stimulated to read through all of them and already have seriously been making the most of them. We appreciate you really being considerably kind as well as for finding this kind of fine useful guides most people are really needing to be informed on. Our sincere apologies for not saying thanks to you earlier. You can definitely see your enthusiasm within the work you write. The world hopes for even more passionate writers like you who aren’t afraid to mention how they believe. At all times go after your heart. Thanks for some other wonderful article. The place else may just anybody get that type of info in such an ideal manner of writing? I have a presentation next week, and I am on the search for such info. great publish, very informative. I’m wondering why the opposite experts of this sector don’t realize this. You must continue your writing. I’m sure, you’ve a great readers’ base already! Somebody necessarily assist to make seriously articles I’d state. That is the very first time I frequented your web page and thus far? I amazed with the analysis you made to make this particular publish amazing. Wonderful job! You made a few good points there. I did a search on the topic and found mainly people will go along with with your blog. Greetings! I know this is kinda off topic but I was wondering which blog platform are you using for this site? I’m getting fed up of WordPress because I’ve had problems with hackers and I’m looking at alternatives for another platform. I would be fantastic if you could point me in the direction of a good platform. Whats Happening i’m new to this, I stumbled upon this I have discovered It positively useful and it has helped me out loads. I’m hoping to give a contribution & assist other users like its aided me. Good job. Wow, awesome blog layout! How lengthy have you been blogging for? you make blogging glance easy. The total look of your website is great, let alone the content! I together with my friends came checking out the excellent solutions on your website and before long I got a horrible suspicion I never expressed respect to the website owner for those tips. Those guys appeared to be for that reason very interested to learn all of them and have now very much been tapping into them. Thanks for genuinely very helpful and also for pick out this kind of excellent resources millions of individuals are really desirous to learn about. My sincere regret for not saying thanks to sooner. Thank you for sharing superb informations. Your web site is very cool. I am impressed by the details that you have on this web site. It reveals how nicely you perceive this subject. Bookmarked this website page, will come back for more articles. You, my friend, ROCK! I found simply the information I already searched all over the place and just couldn’t come across. What a perfect web-site. certainly like your web site but you need to test the spelling on quite a few of your posts. Many of them are rife with spelling problems and I in finding it very troublesome to inform the reality however I’ll certainly come again again. Thanks for your personal marvelous posting! I seriously enjoyed reading it, you are a great author.I will always bookmark your blog and will eventually come back in the future. I want to encourage one to continue your great job, have a nice morning! You could certainly see your skills in the paintings you write. The world hopes for more passionate writers such as you who are not afraid to mention how they believe. At all times follow your heart. I have been exploring for a bit for any high-quality articles or blog posts on this kind of house . Exploring in Yahoo I at last stumbled upon this site. Reading this information So i¡¦m happy to convey that I’ve an incredibly just right uncanny feeling I came upon exactly what I needed. I so much indisputably will make sure to don¡¦t overlook this site and give it a look regularly. A person essentially lend a hand to make significantly posts I would state. That is the very first time I frequented your website page and to this point? I surprised with the research you made to create this particular post amazing. Magnificent activity! You really make it appear really easy with your presentation however I find this matter to be really one thing which I think I’d by no means understand. It sort of feels too complex and extremely broad for me. I’m taking a look forward for your next post, I¡¦ll attempt to get the cling of it! Hi there would you mind lettingme know which web host you’re utilizing? I’ve loaded your blog in 3 completely different web browsers and I must say this blog loads a lot faster then most. fantastic issues altogether, you just received a brand new reader. What would you suggest in regards to your put up that you just made some days in the past? Any positive? you’re in point of fact a excellent webmaster. The web site loading speed is amazing. It seems that you’re doing any distinctive trick. Furthermore, The contents are masterpiece. you have done a fantastic activity on this topic! Hello, Neat post. There’s an issue along with your site in web explorer, may check this¡K IE still is the market chief and a big element of other people will omit your fantastic writing because of this problem. I cling on to listening to the newscast lecture about getting boundless online grant applications so I have been looking around for the best site to get one. Could you tell me please, where could i find some? Useful info. Lucky me I discovered your site accidentally, and I am stunned why this accident didn’t took place earlier! I bookmarked it. magnificent put up, very informative. I’m wondering why the opposite specialists of this sector don’t understand this. You must proceed your writing. I’m confident, you’ve a great readers’ base already! You can definitely see your expertise within the paintings you write. The arena hopes for even more passionate writers like you who aren’t afraid to say how they believe. All the time go after your heart. Whats Happening i’m new to this, I stumbled upon this I’ve discovered It absolutely useful and it has aided me out loads. I’m hoping to give a contribution & assist different users like its aided me. Good job. whoah this weblog is excellent i love studying your posts. Stay up the great paintings! You already know, a lot of individuals are hunting around for this info, you can help them greatly. Hello.This post was really motivating, particularly since I was investigating for thoughts on this matter last Friday. I wish to show appreciation to the writer just for rescuing me from this type of setting. As a result of surfing through the the net and obtaining concepts that were not powerful, I believed my life was done. Being alive without the solutions to the problems you’ve fixed by way of the posting is a critical case, as well as the kind that would have in a wrong way affected my entire career if I had not encountered your site. Your good talents and kindness in touching all the stuff was precious. I’m not sure what I would have done if I had not come across such a thing like this. I can now relish my future. Thank you so much for this high quality and result oriented help. I won’t think twice to recommend your blog to anybody who should have support on this subject. Just wish to say your article is as surprising. The clearness in your post is just excellent and i could assume you’re an expert on this subject. Well with your permission let me to grab your RSS feed to keep up to date with forthcoming post. Thanks a million and please continue the gratifying work. I will immediately clutch your rss as I can’t in finding your email subscription hyperlink or e-newsletter service. Do you’ve any? Please allow me realize so that I may just subscribe. Thanks. I¡¦ll immediately clutch your rss as I can not in finding your e-mail subscription hyperlink or e-newsletter service. Do you’ve any? Kindly permit me understand in order that I may just subscribe. Thanks. I’m still learning from you, but I’m trying to reach my goals. I definitely love reading all that is written on your site.Keep the tips coming. I liked it! Just want to say your article is as astonishing. The clearness in your post is just excellent and i could assume you’re an expert on this subject. Fine with your permission let me to grab your feed to keep updated with forthcoming post. Thanks a million and please continue the rewarding work. It¡¦s in reality a great and useful piece of info. I am glad that you just shared this helpful info with us. Please keep us informed like this. Thank you for sharing. fantastic put up, very informative. I’m wondering why the other specialists of this sector don’t notice this. You must continue your writing. I am confident, you’ve a huge readers’ base already! hi!,I love your writing very so much! percentage we communicate extra about your post on AOL? I require an expert in this house to unravel my problem. Maybe that is you! Looking ahead to look you. I was just seeking this info for some time. After 6 hours of continuous Googleing, at last I got it in your site. I wonder what’s the lack of Google strategy that don’t rank this type of informative websites in top of the list. Normally the top sites are full of garbage. Hi there very nice web site!! Guy .. Beautiful .. Amazing .. I will bookmark your website and take the feeds additionally¡KI am glad to seek out numerous useful info here in the post, we’d like work out extra strategies on this regard, thanks for sharing. . . . . . Thanks for sharing excellent informations. Your web-site is very cool. I am impressed by the details that you have on this web site. It reveals how nicely you understand this subject. Bookmarked this web page, will come back for extra articles. You, my pal, ROCK! I found simply the information I already searched all over the place and simply could not come across. What a perfect website. Somebody essentially help to make significantly posts I might state. That is the first time I frequented your web page and to this point? I amazed with the research you made to create this particular publish amazing. Wonderful activity! I¡¦ve been exploring for a little bit for any high quality articles or weblog posts on this kind of space . Exploring in Yahoo I ultimately stumbled upon this site. Studying this info So i¡¦m satisfied to exhibit that I’ve an incredibly excellent uncanny feeling I discovered just what I needed. I such a lot for sure will make certain to do not put out of your mind this website and give it a glance on a relentless basis. What i don’t understood is actually how you’re not actually much more well-liked than you might be right now. You are so intelligent. You realize therefore significantly relating to this subject, made me personally consider it from a lot of varied angles. Its like men and women aren’t fascinated unless it is one thing to do with Lady gaga! Your own stuffs great. Always maintain it up! It is the best time to make some plans for the future and it is time to be happy. I’ve read this post and if I could I wish to suggest you few interesting things or tips. Perhaps you can write next articles referring to this article. I want to read even more things about it! Hiya, I’m really glad I have found this information. Today bloggers publish just about gossips and web and this is really frustrating. A good website with exciting content, that is what I need. Thank you for keeping this site, I’ll be visiting it. Do you do newsletters? Can not find it. Hiya, I’m really glad I have found this information. Nowadays bloggers publish only about gossips and internet and this is actually irritating. A good web site with exciting content, this is what I need. Thank you for keeping this web site, I’ll be visiting it. Do you do newsletters? Cant find it. I cling on to listening to the newscast talk about receiving free online grant applications so I have been looking around for the finest site to get one. Could you tell me please, where could i find some? I¡¦m not certain the place you’re getting your info, however good topic. I must spend some time learning more or understanding more. Thanks for great information I used to be looking for this information for my mission. I actually wanted to make a simple word in order to thank you for all the splendid guides you are giving here. My incredibly long internet look up has now been paid with professional suggestions to share with my best friends. I would suppose that most of us visitors actually are quite fortunate to be in a notable network with very many awesome people with useful pointers. I feel extremely grateful to have used the website and look forward to some more cool moments reading here. Thanks once more for everything. I do accept as true with all of the concepts you have offered in your post. They are really convincing and can definitely work. Nonetheless, the posts are too quick for novices. May just you please extend them a little from subsequent time? Thank you for the post. I really wanted to type a message to express gratitude to you for all the unique suggestions you are showing at this site. My extended internet look up has finally been rewarded with excellent tips to go over with my partners. I would assume that we readers are truly lucky to dwell in a fantastic website with very many brilliant professionals with good opinions. I feel quite grateful to have come across your website and look forward to so many more fabulous moments reading here. Thanks once more for everything. I¡¦ll right away grasp your rss as I can’t in finding your email subscription link or e-newsletter service. Do you have any? Please permit me recognize in order that I could subscribe. Thanks. I wanted to write you that little word to say thanks a lot the moment again relating to the spectacular information you’ve documented on this site. It has been certainly remarkably generous with people like you to offer unreservedly what a lot of folks could possibly have offered for sale as an e book to make some profit for their own end, most notably considering the fact that you could have tried it in case you considered necessary. The pointers as well served to be a good way to recognize that someone else have the identical interest much like my own to know a lot more around this problem. I know there are numerous more fun instances up front for individuals that take a look at your blog. 7AKofZ Say, you got a nice post.Thanks Again. Really Great.